1. Preheat oven to 350 degree F and line cookie sheet with parchment paper. 2. Combine flour, coconut milk powder, baking powder and nutmeg. 3. Cut the butter into the dry mixture until it resembles fine breadcrumbs. 4. 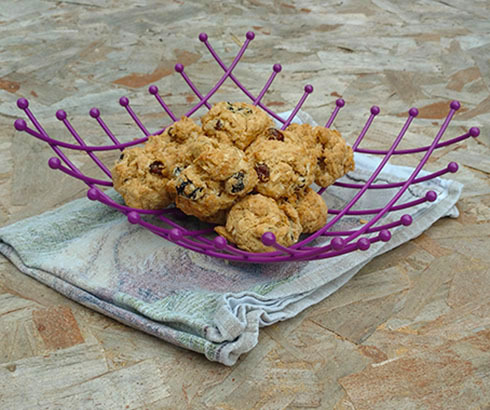 Mix in the brown sugar, raisins and shredded coconut using a wooden spoon. 5. Combine beaten egg, milk and vanilla. Make a well in the centre of the flour mixture and pour in the liquid. 6. Combine the mixture until it comes together. Mixture should just stay together and look very roughly mixed. Do not over mix. 7. Use a spoon to drop (your desired size) the mixture onto lined baking sheet and bake for 26 mins. Remove from oven and cool on a rack. Keep the cakes the same size so they will all be ready at the same time. Using an ice cream or cookie scoop helps. Rum-soaked raisins add a mild, pleasant, boozy taste. The 'rummy' taste comes through if you let them sit for a little while.